Why can’t I draw a report? If your candidate has been scored and you see the 100% icon, but you get an error message when requesting your report, there might be some outstanding biographical detail for the candidate. Re-enter the candidate profile and complete all compulsory information. Click on the Candidates button in grey margin on left of the screen. Select the name of the candidate and click on the yellow pencil icon (Edit). Drop down Edit Candidate tab just below the blue Active Selection bar. Select Edit Biographical details and complete all fields. Save before leaving the page. Click on Individual Reports in the block allocated to ELSA Reports on the Home page. Change ACTIVE SELECTION to the Type of ELSA. Select ELSA Individual Report on the drop-down menu. You can also draw a spreadsheet of a batch of candidates' results by clicking on the Batch Reports button. Why has my candidate not been scored yet? There might not be a credit available for the scorer to enter the script. Check the credit balance for the specific product uploaded. The script has not been uploaded yet. You will not see a file name in the Documents column. The uploaded document is not correctly scanned. The wrong product was selected when creating the candidate. Especially e-ELSA will not enter the manual scoring process line and we will not know about your pending candidate. Where can I view the credit balance? ​On the Home page, click on the button ‘Order Credits’. How can I view the order history of credits? ​On the Home page, click on the button ‘View Order History’. How do I upload the script if I created the candidate earlier? On the Home page, click on Candidates in the grey bar on the left of the screen. Next to the candidate’s name, click on the yellow pencil icon for Edit. Dropdown Access Candidate Data (Below the blue Active Selection bar) and select Manage Documents. Click on the Select File button to browse to where the candidate’s script is saved on your hard drive. How can I use the Phase field to organise candidate info better? ​The Phase field is available for organisation of information by the client. You may create as many Phases under the Project (Type of ELSA) as you wish. This would typically be grouping candidates according to department, function, purpose for assessment or batch names of groups. Tip: Standardise the method of entries by all users in your organisation, as this will enable you to effectively use the data filter function in Excel. This is especially valuable when your company data is scrutinised for typical profile and trends. Select the ELSA product to be used in Active Selection. Click on Administration in the grey margin on the left of the screen and select Phases. Click on Create Phase top right of the screen and complete the field to describe the group. Save the screen. When you register candidates, make sure you select this Phase in the Active Selection. On the Omnicor log-in screen, just below the username and password field, you can click on Forgot your password? to request a new one ONLY IF YOU ARE A REGISTERED USER. You will be prompted to enter your e-mail address - this has to be the same as what you were registered with. You will be sent an e-mail with instructions to renew your password. How much time must I allow for scoring? ​Scoring, grading and processing of the paper-based ELSA is performed on-screen and we aim to complete within 24 hours (excluding week-ends). The accurate scanning, registration and uploading from the client is essential to process successfully. Larger batches should be negotiated. Bulk scripts can be delivered to the scoring office in Alberton (not scanned), but candidates must still be created by the client user. 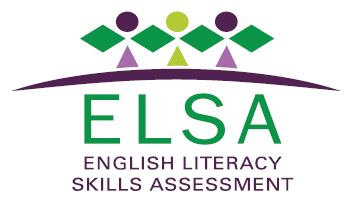 e-ELSA is electronically scored and reports available immediately. Where can I get a Master copy of the ELSA scripts? ​You can download the latest copies of the scripts from the Home page once logged into your profile. Click on one of the types of ELSA bottom left of the screen. Watch the video for the procedure to set a unique password to allow your candidates access to e-ELSA.